The Olde Towne Market is like a street market where many local vendors set up temporary stalls and sell their products. This weekly market is held only on Saturdays or Sundays on certain months of the year between 2pm - 6pm on Water Street. The day of the week may change in a year. Usually it's held between April through November. The market was first initiated in October 2010. Since then it is run by dedicated volunteers. Originally it was known as the Ghost Town Market, essentially serving as a social networking platform for the locals and even for the tourists. Due to drop in passenger cruise ships in St. George, this market had a bad patch in between and ceased to operate for a while. But the good news is it has been again revived. Vendors put up their stalls along the street side and sell all kinds of items. Sellers include farmers selling fresh food, gardeners, fishermen, hot and cold food vendors, crafts people, artists, face-painters, buskers and lot more. This is like a mixture of country fair and a flea market. The Olde Towne Market also attracts many street performers. As you walk along, you will find guitarists, vocalists, violinists and others performing on the street. While most of the performers come to the market alone, they often combine to form a mini band. It becomes a great festive atmosphere. Vehicles are not allowed on Water Street when the market operates. It becomes a pedestrian only zone from 1pm onwards. There is a committee of dedicated St. Georgians who run the market. It is now a joint venture between local businesses, Bermuda Chamber of Commerce, St. George's Corporation and an organization known as EEZA. 2pm to 6pm on Sundays. Vendors start setting up stalls at 12:30pm. NOTE: These days the market is not held every year and depends on funding & sponsorship. 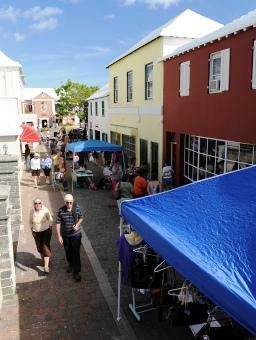 Update April 2015: This year the Olde Town Market at St. George will be held only on last Sunday of the month (April through November) between 2pm to 6pm. So the dates are April 26, May 31, June 28, July 26, August 30, September 27, October 25, and November 29. The Olde Town Market is set up on Water Street (near Kings Square) along the dock. In case of rain, the venue shifts to Penno's Wharf Cruise Ship Terminal area. 2) Check out St George Attractions to know about the great tourist attractions in St George.